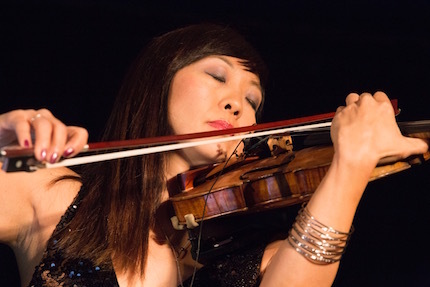 NMNC welcomed back pianist Kathleen Supové, this time with collegues violinist Jennifer Choi and guitarist James Moore to open our season with a New Music Cabaret in Club Sudakoff. 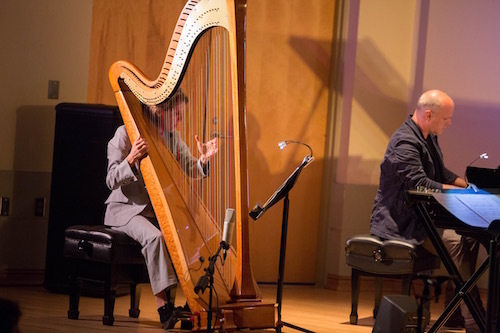 The three musicians played together (in Lainie Fefferman's Imposter Syndrome and in an encore, At Year's End, by Vijay Iyer); in pairs (Choi and James in Terry Riley's Cancion Desierto and Choi and Supové in Randall Woolf's Anti-Fragile Etude #1: Small Losses); solo (Choi performed Preston Stahly's Sapphire, Moore selections from John Zorn's The Book Of Heads, and Supové Jacob TV's The Body of Your Dreams); and, at the end, with a group of New College students—the New College Desolation Strings—on Moore's Desolation Pops. This was a wide-ranging concert, performed by masters. 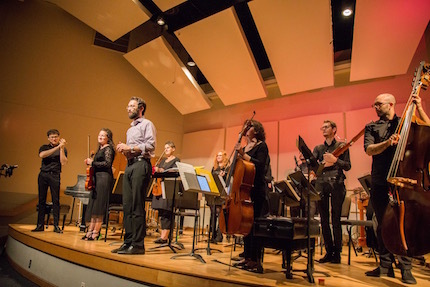 The Zorn was a slap-bang exercise in extended techniques, the Riley was a beautiful dance, the Fefferman was an intriguing investigation of a psychological phenomenon using music and spoken words, and Moore's finale was an ethereal work where wisps of sound enveloped the room. 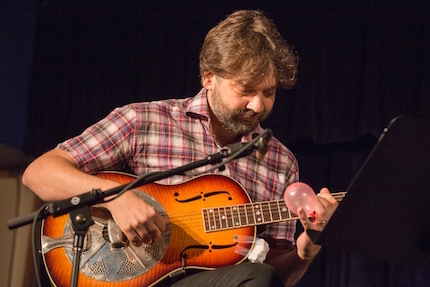 While in residence Supové met with New College composition students to discuss the realities of taking works from composition to performance and gave a workshop at Booker/VPA High School, introducing the students to the concept of a graphic score, then playing their compositions. 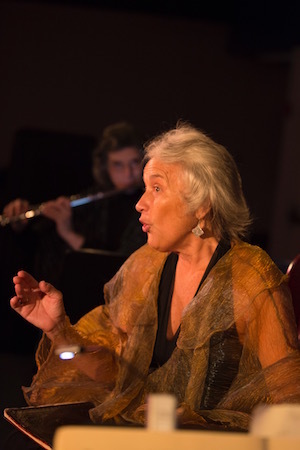 New York's Da Capo Chamber Players came to NMNC with guest soprano Lucy Shelton to perform, among other works, Arnold Schoenberg's dramatic—and surprisingly funny—Pierrot Lunaire, which we presented in the cabaret atmosphere of Club Sudakoff, complete with supertitles in English. 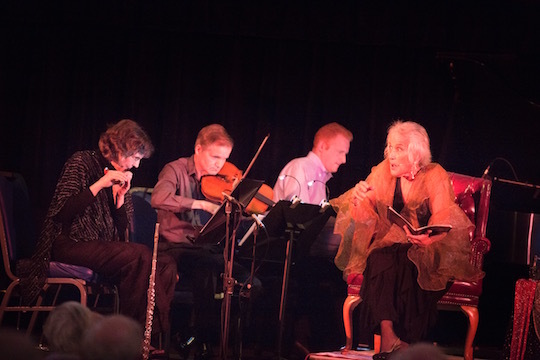 In keeping with the theme of lunar influences, Da Capo (Patricia Spencer, flute; Meighan Stoops, clarinet; Curtis Macomber, violin; Chris Gross, cello; and Steven Beck, piano) opened the concert with George Perle's Nightsong (written in 1990 for Da Capo), then Shelton and Beck performed a series of songs related to night. Their performance of Pierrot Lunaire was engrossing. (You can watch the entire piece on video, above.) Filled with drama, pathos, eerie humor, and more than a dollop of the grotesque, Pierrot Lunaire was given a masterful and vivid incarnation by the performers, and brought Club Sudakoff to its feet at the conclusion. 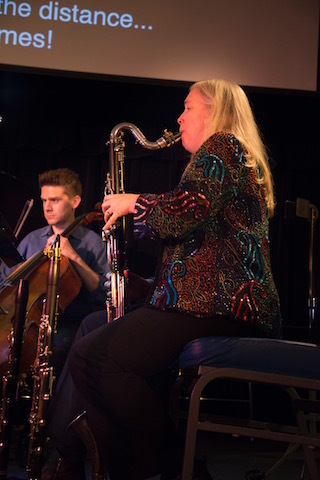 While at NMNC the performers worked with New College composition students and went to Booker/VPA High School, where they let students in a Schoenberg canon and them worked with them to compose and perform a new canon of their own. We're still not quite sure just how we fit fifteen musicians, along with their instruments, music stands, a grand piano, and an astounding amount of percussion, on the Sainer stage. But ensemble mise-en, complemented by pianist Yumi Suehiro and extra percussionist Jeff Stern, filled Sainer not only with people but with amazing sound. 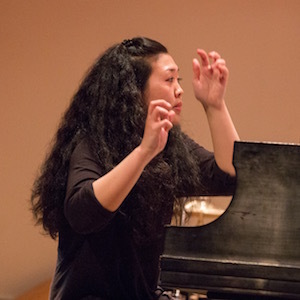 Beginning with Hans Abrahamsen's Märchenbilder, conductor Moon Young Ha (also the founder and director of the ensemble) led ensemble mise-en through an increasingly complex program. New College alum Jason Carl Rosenberg's haunting A Crimson Dawn was next, and the composer came back to New College to introduce the piece. 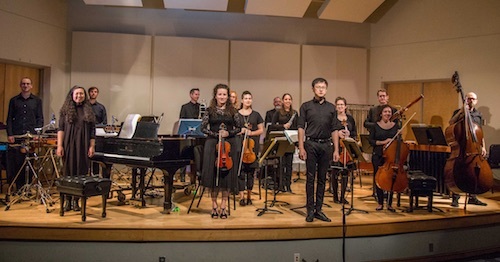 The main feature of the concert was Ligeti's phenomenal Concerto for Piano and Orchestra, a tour de force that demands an immense amount of concertation and energy from pianist and orchestra, and the players rendered it with nuance and incredible energy. For the audience it was a rewarding experience, as evinced by the standing ovation. 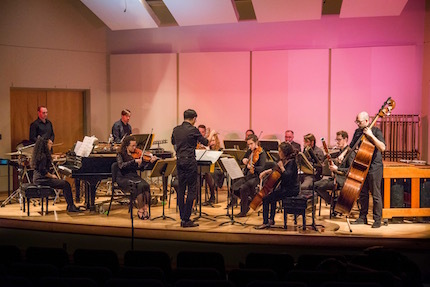 Here are the rest of the orchestra members: Kelley Barnett flute; Tamara Winston, oboe; Vasko Dukovski, clarinet; Pierre Lidar, bassoon; Elizabeth Martignetti, horn; Hugh Ash, trumpet; Mark Broschinsky, trombone; Josh Perry, percussion; Maya Bennardo, violin; Hajnal Pivnick, violin; Hannah Levinson, viola; Maria Hadge, cello; and Evan Runyon, bass. 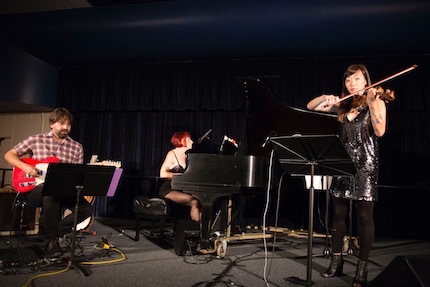 They, along with Moon Young Ha, Yumi Suehiro, and Jeff Stern, were quite enough to fill the Sainer stage! 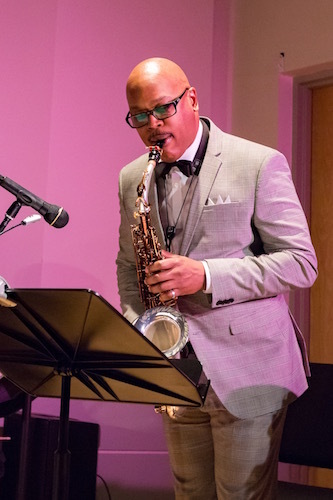 In addition to meeting with New College composition students, we were able to take about half of the players to Booker/VPA High School, where they performed a piece comprised of cells of extended techniques, then had students use these cells to compose their own pieces, and then performed them. 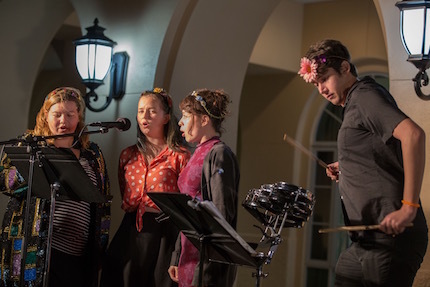 We took over the outdoor PepsiCo Arcade in March, putting seventeen performers at the cardinal points with the audience in the center, for our explosive performance of Cornelius Cardew's experimental work for drummers and singers, The Great Learning, Paragraph 2. 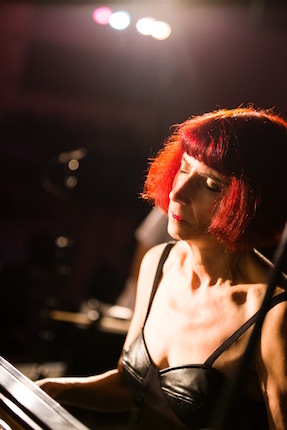 At each stage one drummer, one lead singer, and two or three supporting singers progressed through melodic and rhythmic patterns at their own pace, and, in the case of the drummers' patterns, in whatever order they chose. Performers included New College students, faculty, staff, alumni, and friends from the community. To the north were drummer ori, lead singer Melissa Simmons, and supporting singers Araya Barnes, Alma, and Thaleia; to the east were drummer Allie Stachura, lead singer Stephen Miles, and supporting singers Paul Lewis and R. L. Silver; to the south were drummer Erich Barganier, lead singer Emma Kervel, and supporting singers Juliana Lind and Eugenia Titterington; and to the west were drummer James Kushner, lead singer Olivia Buth, and supporting singers Sheila Foley and Leslie Townsend. But that's not all! 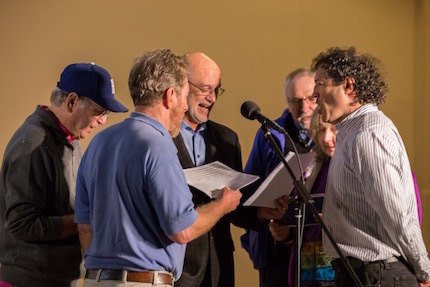 Audience members were encouraged to join the singers (there were piles of the score at each stage, and anyone could sing along with the supporting singers, following a leader), and many did, some even doing so at more than one stage during the piece. You can see video of the entire performance above. 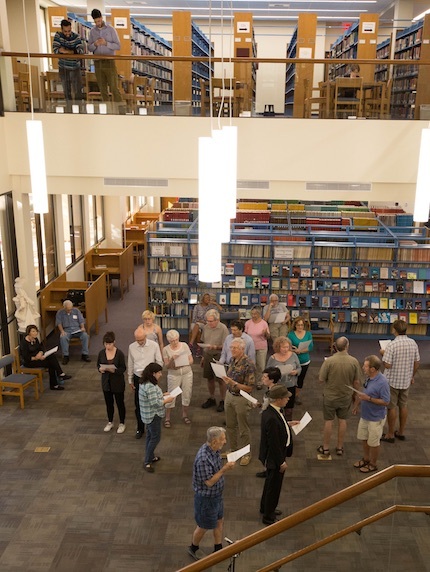 In addition to Paragraph 2 we presented a free and inclusive performance of The Great Learning, Paragraph 7, for voice, the Friday before this concert, in New College's Jane Bancroft Cook Library. Audience members for this, more meditative piece, were also encouraged to join the performers, and to wander through the performance space, as seen in the photo to the left. You can read more about both Cardew pieces and see the score for Paragraph 7 here. We ended our season with two performances of a world premiere! 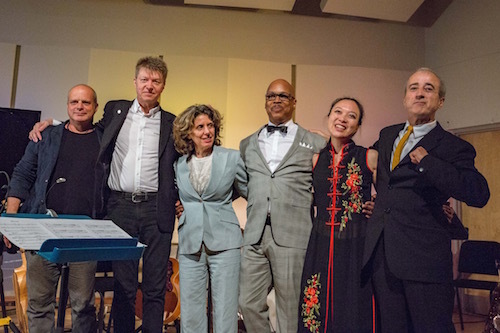 Bobby Previte, who was awarded the Hermitage Artist Retreat's Greenfield Prize in 2015, composed Rhapsody (Terminals Part II: In Transit) as a commmission stemming from that prize, and New Music New College had the honor of presenting the first performances. 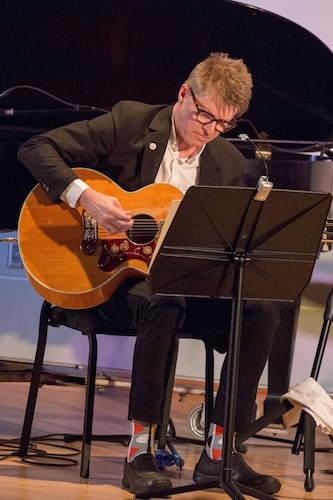 Alongside Previte himself (on trap drums, guitar, autoharp, and harmonica) were Nels Cline (guitars), John Medeski (piano), Greg Osby (alto saxophone), Zeena Parkins (harp), and Jen Shyu (voice, er hu, percussion, and piano). 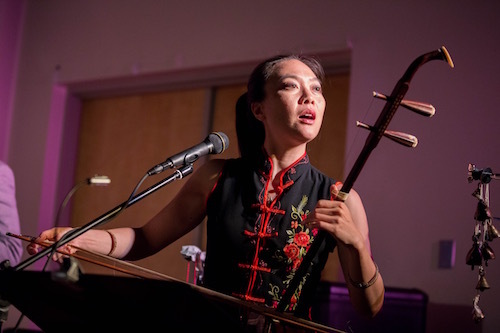 Rhapsody had nine sections, outlining a journey taken by both the performers and audience. 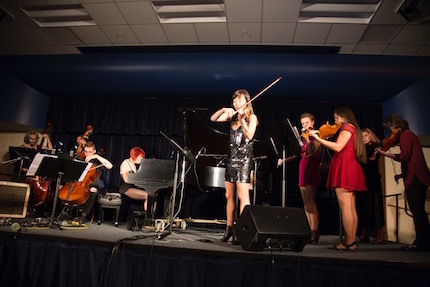 The concert-length piece included solo work from all of the performers as well as impressive ensemble playing. 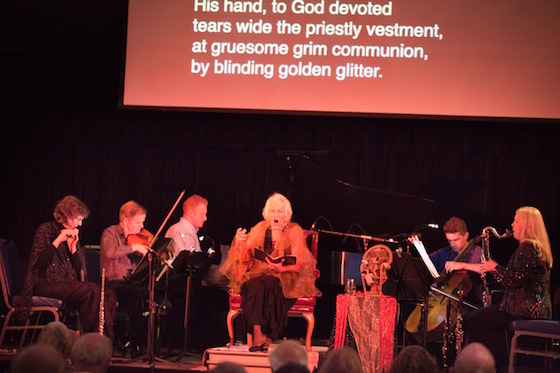 Many audience members found it a deeply moving experience, and it brought both Friday evening and Saturday afternoon's audiences to their feet. While in residence Previte met with New College composition students to discuss the realities of taking a composition through to performance. Percussion instruments for our January, March, and April concerts were kindly supplied by Florida Percussion Service. 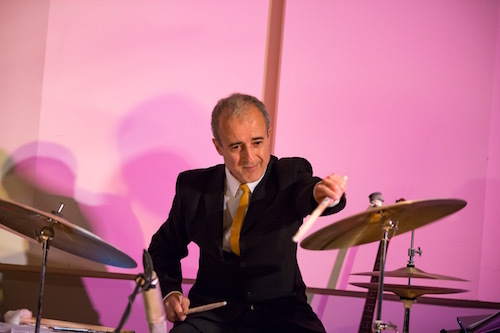 The Bobby Previte concert was sponsored in part by a grant from the Andrew W. Mellon Foundation.